Ruthi Reads Books For Kids - Read, Review, Rave! Reading TO a child rather than WITH a child is about as productive as it is when people talk AT me as opposed to WITH me. Picture this: a round-table discussion where everyone gets a turn at expressing themselves, each thought as important as another. Now, imagine a group of kids sitting cross-legged in a reading circle on the floor, the teacher right there alongside them, and the kids all scrunched up as close to that teacher and book as they can be. It is pretty obvious which groups shall enjoy the discussion in each scenario - and willingly come back for more! I asked myself this question: Do you like it when people talk "at" you or would you rather they talk "with" you? To keep my own conversational skills in check, today I read a great article about communication. I equated the information for working relationships with that of my desire for children to read books. If I want kids to read, I cannot just throw the book at them. I need to get in there with those kids and have us reading TOGETHER. This means permitting them to turn the page before I'm ready or to turn it back because they need to hear it again. It means allowing them to interject their exclamations of excitement or (heaven forbid) their dismay. 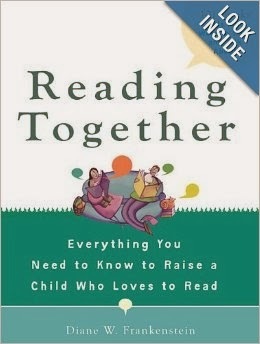 By paying attention to those in the reading circle I will learn as much about them as they will about the book. And what I do with this knowledge shall determine the outcome of my wish to encourage kids to read. Take a book off the shelf and read with your children. Talk about the book with them. Sometimes these conversations are ever so much more valuable than the story itself at the moment. If we do this, we can rest assured that more often than not a child will eventually read the book - and the child will eagerly return for another! As an Amazon Associate, I may earn income via links in this article. Thank you, Ruthi, for gathering us together to share with each other and to learn from each other. You are a shining inspiration and your love of children shows. You are, of course, absolutely right! I honestly do believe my children started reading so early in life because we did it together. Even as they got older and could read for themselves, we each had a book when we were relaxing during the evenings. I used the read the books they were assigned to read and we would discuss them. We all benefited from this shared activity. I enjoy the vision of each family member relaxing together with a book in their hands, Cynthia. Shared activity is so much better for all concerned than going it alone. Not sure what happened with my daughter. I love books, and started reading with her when she was still just a baby. I would try and get her involved, and at a young age, she was. But hated then hated reading through grade school as most of the books they were made to read were really boring. She could never pick what she liked. As a senior in high school, she is now becoming interested in reading - but only what she picks out. Personally, it sounds to me like your daughter has a mind of her own, likes and dislikes of her own, and the problem is just as you have described - the books she was MADE to read in school were boring to her. That's the "dismay" part we adults need to listen to. I had similar issues in school and resented being told what I had to read. As one who was buried in reading books, either I thought the teacher's reading list was indeed boring, or I had already read the book on my own. You did good, the foundation you gave her will help bring her back to books! That's such a great point. Thinking back, I'm pretty sure I always read "with" 'my kids and not just to them. Biggest mistake I made was stopping the tradition too soon, probably after the elementary grades. We should have continued until the day they left home! I am guilty of the same, Susan! And I do agree, it is important to continue reading with our kids at all stages of their growing up years, which encourages reading and learning throughout a lifetime. I love what you have shared here. Engaging reading, especially when children see it modeled as a high family value, is contagious. I believe children crave this kind of time with the significant adults in their lives. I believe you are quite right, Diana. Children want, and need, only the good things life has to offer, and reading together time is certainly one of the good things. I like your description of the children all scrunched together with you reading, that is definitely more fun and meaninful. Oh, yes, Claudia, it is ever so much fun to get right down into that group of kids to see what they see, hear what they hear, and listen to what each of them has to say. This article brings up a valid point about teaching communication skills which extends beyond literacy. Great writing, Ms. Sunshine! Indeed it does, Charli, and thank you for noticing that fact! Children learn and catch on so much quicker if you do thing "with" them. I'm a strong believer that when you read with you children you do exactly that .... read with them. Great post Ruthi! I am so glad you are with me on this point, Susan! Reading, as well as other things, done "with" is a "show me" versus "tell me" way of communicating. Ruthi thanks you for Reading, Reviewing, and Raving about Books For Kids!